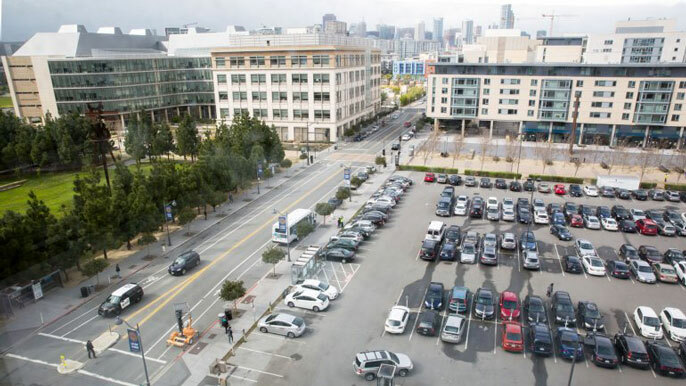 The new UCSF neurosciences building at Mission Bay will be constructed at the site of the Fourth Street surface parking lot, known as Block 23A. UC San Francisco is moving forward with plans to construct a new building at its Mission Bay campus to support its world-class neuroscience enterprise at a time of great opportunity for advancement in the field, following approval by the UC Regents on Thursday. The planned building will strengthen research and patient care conducted by the departments of Neurology and Neurological Surgery, which are the top recipients of competitive research funding from the National Institutes of Health and are ranked among the best in the nation by U.S. News & World Report. In addition, the building will bring together psychiatry bench lab research with other basic research in the neurosciences, as well as clinical and support spaces, to drive advances aimed at new treatments for disorders of the brain and nervous system. A primary goal is to fold basic research in psychiatry into the neuroscience program, placing top investigators in labs side by side, to accelerate understanding of the brain and build on that knowledge to develop treatments for psychiatric disorders, such as depression and schizophrenia. Combined with the nearby Sandler Neurosciences Center and Arthur and Toni Rembe Rock Hall, the neuroscience complex at UCSF Mission Bay will become one of the largest in the world. The building will be constructed on the current site of a parking lot on Block 23A, which is just north of Mission Hall, between Campus Way and Gene Friend Way and between Fourth Street and the Third Street Garage. The Regents Committee on Grounds and Buildings unanimously approved UCSF’s request to allocate $21 million in campus funds to engage architecture and construction resources to begin planning for the 270,000-square-foot, six-story building. This funding for preliminary planning is consistent with other projects, as a percentage of the total project budgets. This upfront investment in design will pay off in ensuring that UCSF delivers the building on time and on budget, as UCSF has done in previous projects, Hawgood said. Pending budget, design and environmental approvals, construction is expected to begin in fall 2017. Many of UCSF’s neuroscience facilities are currently spread around multiple sites in San Francisco, including the Parnassus Heights campus, Hunters Point and various spaces at Mission Bay. The planned building will house these disparate facilities under one roof to promote collaboration. Co-location of wet and dry research labs on the same floors, which is needed for better collaboration and isn’t possible in the Sandler Neurosciences Center. Wet lab space for the Department of Psychiatry, to complement the proposed office and outpatient psychiatric building at 2130 Third Street in the nearby Dogpatch neighborhood. Neurology outpatient clinics on the ground floor that expand clinical offerings and consolidate more of UCSF Health’s neurology services at Mission Bay. The complex building program requires a high degree of structural, mechanical and electrical design work that will be coordinated with specialists and end-users during the planning phase to ensure that the final space meets exacting specifications. A committee, with representatives from the Academic Senate and other stakeholders, will ensure that UCSF implements the newly developed principles for programming, designing and governing the building to incorporate input from future occupants.